Atheneum Books for Young Readers, 9781442494589, 128pp. Violet and Rose have shared their best secrets under the big oak tree in Clover Park. And they have found some very good small things there too. So when Johnson’s Tree Services stomps in and posts a sign that says PUBLIC NOTICE–TREE REMOVAL, they know that they must do something to stop them. When their first protest washes away in the rain, Violet and Rose feel discouraged. But then they realize that the sort of people who care most about small things, like birds not having nests and people not having a place to collect acorns, might also be the sort of people who notice very small protests. And that gives them a quite brilliant idea, one that just might save their tree, on behalf of all the small things—and small people—who love it. Anna Branford was born on the Isle of Man and spent parts of her childhood in Africa and in Papua New Guinea. Now she lives in Melbourne, Australia, with a large black cat called Florence. She writes, drinks cups of tea in her garden, and makes dolls and other small things, which she sells at early morning markets. Anna is the author of the Violet Mackerel series. Visit her at AnnaBranford.com. Elanna Allen lives in New York with her husband and sons, where she writes and illustrates children’s books and designs characters for television. She wrote and illustrated Itsy Mitsy Runs Away and has created characters for Disney, Nickelodeon, and PBS. Stop by and say hi at ElannaAllen.com. "In her sixth book, Violet and her friend Rose discover that their favorite oak tree is scheduled to be cut down to make way for a parking lot. . . . Branford manages to make circumstances work out for Violet, a good-hearted kid who can figure out what she is feeling before she speaks. The fortuitous ending . . . reads like just desserts." 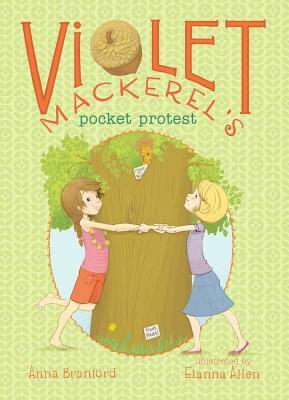 "When Violet and her friend Rose learn that their favorite oak tree is to be cut down, they organize a small protest with a big result. . . . Readers need not have read the five previous titles to appreciate Violet and her family. . . . Aussie Violet's world is just different enough to provide an interesting change for readers entering the chapter book stage. They will quite like the family's Saturday market stall, with its knitted nests and china birds, and they will enjoy the friends' success. . . . A characteristically intelligent entry in a consistently appealing series."